The DIY Guide for shooting Kirlian images with digital equipment. 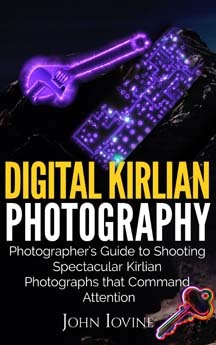 The book will instruct readers how to shoot Kirlian photographs using digital cameras, iPhones and low light video cameras. Whether you’re a beginner or pro, you will find the instructional information to shoot brilliant Kirlian photographs. The book contains step-by-step instructions for building a variety of DIY Kirlian photography devices and accessories. Fine Art prints for fun and profit. Sell the Kirlian images you create, print on canvas and other media like cups and tee shirts. Create one of a kind fine art prints you can sell on Etsy. In Kirlian Photography, John Iovine gives you all the hands-on guidance you need to produce Kirlian photographs. Plans and instructions are included for building your own electrophotography equipment. From building high voltage power supplies to using 4" x 5" sheet film, standard 35mm film or video cameras. You'll also learn about the history of electrophotography and may of its possible applications in medicine, industry, and the military. Especially illuminating is his discussion of the "phantom leaf" aura that continues to baffle scientists.